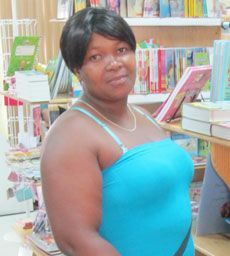 Quashie, the mother of four, was one of the first four winners in the promotion launched by the newspaper on Wednesday, February 16. She won herself a $20 gift voucher from Jujube bookstore, by reading the Searchlight Midweek edition of February 22 and finding the answers to five questions published in that same edition and on Searchlightâs website: www.searchlight.vc. Three other persons: Caroline Sutherland, Shurnette Thompson and Juanita Glynn, won prizes from co-sponsors Courts (SVG) Ltd., Digicel and Bickles, respectively. Sutherland won a pair of cubic zirconia earrings; Thompson, $25 credit and Glynn, a $10 patty meal. The answers to last weekâs questions and the names of the winners were published on page 24 of the Searchlight Weekend edition of February 25. The competition continues this week and will run until the end of the year. Readers have until midday on Wednesday, March 2 to email the answers to this weekâs questions to moliciacharles@searchlight.vc. Answers may also be placed in a sealed envelope and dropped off at Searchlightâs Lower Kingstown Park office. Last week, 73 entries were received in a mere 30 hours. The first four correct entries drawn will receive this weekâs prizes. This weekâs questions can be found on page 5 and on www.searchlight.vc.